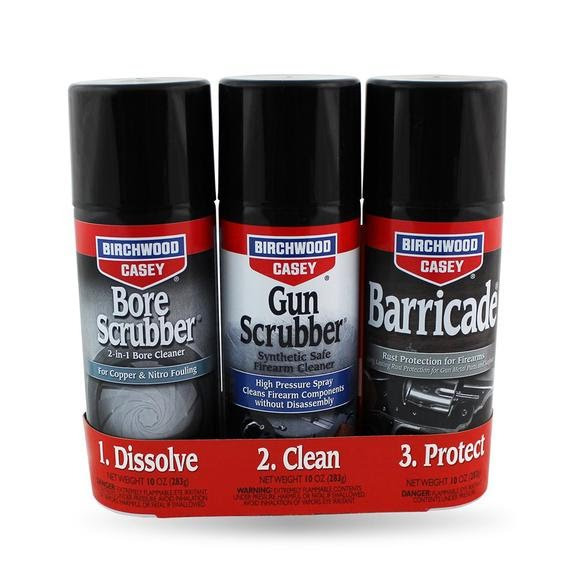 Birchwood Casey's 1-2-3 Aerosol Value Pack makes gun cleaning quick and easy. 3 steps to clean your firearm: dissolve, clean and protect. First, use Bore Scrubber® to dissolve copper fouling and residue left behind from firing your firearm. Second, clean out the dissolved material with Gun Scrubber®. And, third, cover with Barricade® to protect your firearm from rusting. Birchwood Casey &apos;s 1-2-3 Aerosol Value Pack makes gun cleaning quick and easy. 3 steps to clean your firearm: dissolve, clean and protect. First, use Bore Scrubber® to dissolve copper fouling and residue left behind from firing your firearm. Second, clean out the dissolved material with Gun Scrubber®. And, third, cover with Barricade® to protect your firearm from rusting.